I needed to replace some broken spindles from an early 19th century banister in my home in Southsea, Hampshire. A friend told me about Greg Wright in Hindhead and I went up to see him in his workshop, taking one of the broken spindles with me. It was a small job compared with much of fine handmade furniture that Greg makes but the four spindles he made and stained/polished to match the existing ones were absolutely perfect. He is a real craftsman, one of a dying breed, but thank goodness he is young and has a long working life ahead of him. . I thoroughly recommend him. From: Mr Michael Bilton, Southsea. 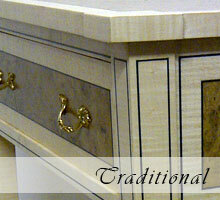 We came to Greg after having been let down by two other furniture makers. For Greg nothing was too much trouble, he went above and beyond to ensure we got exactly what we wanted, and in record time. His communication throughout was first class, sending photos and phoning regularly to discuss progress and go through details with us. His passion and enthusiasm for his craft is evident in the end product. We couldn't be happier to recommend Greg to anyone who values the highest quality craftsmanship and good value. Our only regret is that we didn't go to him first. From: Mr Adam Southern, Guildford. I was completely satisfied with the Piano Stool beyond my expectations, I would recommend Greg for any object made in wood. From: Mr Chris Tierney, Liverpool. Greg made us a made to measure wine cabinet for a small area, his design skills were very much put to use. Again his professionalism and knowledge have exceeded our expectations. An amazing piece of craftsmanship. I cannot recommend Greg enough. From: Miss Dottie Morel, Farnham. Removing stains/scratches from an old coffee table and wooden bench and re-varnishing. Greg breathed new life into two pieces of old but lovely furniture we have been given. Stains and scratches have disappeared and Greg gave useful advice on which stains to choose. He also sent a photo to check I was happy with the colour of one particular piece that I was keen to match with other furniture. He is now doing another job for me and I am very happy to recommend him to others. From: Mrs Sarah Millar, Godalming. 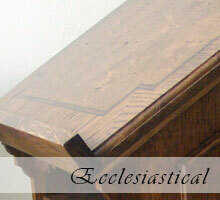 Designed and hand made, to order, a dark oak church cabinet chest. 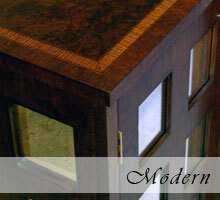 Greg's cabinet is an exquisite piece of craftsmanship completed to the highest standards. Our church now has a piece of furniture which will be used and enjoyed for generations to come. Throughout the work we were kept informed of progress and photos sent to show the stages reached. Delivery was competently arranged, on time and organised to avoid clashes with church services and events. You could not wish for a better person to work with. From: Mrs Yvonne Jackman, Chessington. I just wanted to let you know how much we love the bookcase you made for us. It fits in so well with our existing furniture and we've had many compliments about it. In fact, I understand that my friend may soon be commissioning you to work on a storage unit for her living room. 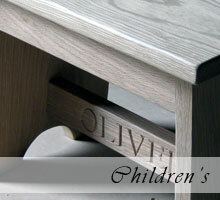 The quality of your work is first class and your craftsmanship superb. You are clearly passionate about your work and rightly proud of your skills and this shows through in the bookcase you made for us. It was an absolute pleasure working with you and I particularly liked the way you took my designs and subtly modified and perfected them to create a piece that I had always imagined but never found in the shops. I wish you every success in your business and should any of your future clients require a reference I would be delighted to provide one. I am only too pleased to say that we are delighted with the Lectern you made for us. It suits the room perfectly and you have matched the wood stain to other furniture to make it look as though it has always been there. We particularly appreciated your advice on what works and what wouldn't. The 'curly bits' you added are just right and all in all we are absolutely delighted with the result, the very reasonable price and quality of workmanship. If any potential client would like to come round and see the finished piece just let us know. A bespoke hanging retail display cabinet for a high end hair salon in Cobham Surrey. Rated by customer on 17/09/2012 Lorenzo Favata Very professional and with great communication. Always felt the job would get done well. It was with expectations exceeded. 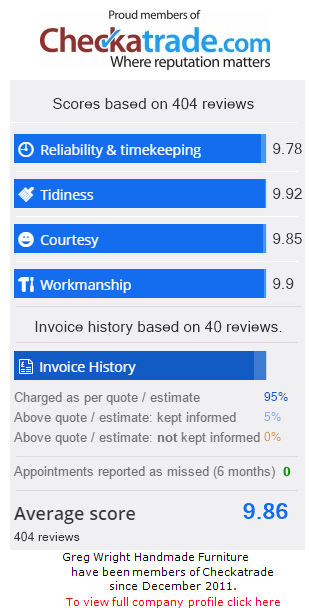 Rated by customer on 14/06/2012 Clare Gibb Greg did a great job fixing a chair spindle. He matched a new one to existing and the result is that you can't tell a repair has been made. He arrived on time and collected/returned my chair within a couple of days. I was very pleased with the outcome.